As marketing professionals, we are constantly on a look out for more effective ways to tap trends and acquire customers. We keep on brainstorming for better strategies to achieve success. But we tend to forget that a right start can win half the battle. Most marketers do not pay careful attention to goal mapping. Goal setting leads to clarity of purpose and action. To tackle the tasks at hand marketers need to set quantifiable and measurable objectives to achieve the target. What to achieve, when to achieve and how to achieve become crucial in goal setting. Frequent monitoring of goals can show you the direction where you are heading. Besides developing a strategy, marketing teams also face difficulty in focussing on a strategic action plan based on your requirements. Managing routine activities is a constant challenge. All this is time consuming. You often do not know which activity is essential and which is non-essential. The best way to tackle this problem is by following a checklist that will help you eliminate wheat from chaff and maximize your daily time to perform better. In this blog post, we’ll also look at some of the crucial elements of goal setting to optimize your marketing campaigns’ performance and build success. Keep the larger purpose of your marketing campaigns in mind when you start. Think about creating a long term marketing strategy. Having a good idea of what your larger goals are will help you to plan your marketing journey effectively. Every smaller goal that you set should be aimed to serve your larger objective. Some long term goals might include creating brand awareness, building brand equity, increasing follower base etc. 2. Do You Know Your Present Status? Your future can’t be built without fully understanding your present. It’s important to set benchmarks in the present so that your future emerges strong. For this you should know your starting point. The best way of doing it is to run an audit on your existing marketing initiatives both online and offline, so that you know where you stand. This strategic initiative will help you to set things in order before developing a successful marketing plan. It is also a good idea of knowing realistically what to achieve and when to achieve. Most often people fail to achieve their goals because either they are vague and too broad or are unrealistic. 4. How Interesting Are Your Goals? Does your goals appear interesting and challenging or are they routine and monotonous. Every goal you set should throw some challenge for your marketing team. Your team begins to grow as it starts overcoming challenges on the way thereby improving overall performance of your campaigns. You need to regularly keep track of your marketing metrics to monitor progress of your goals. By keeping track of your campaign performance this way, you can make adjustments in your strategy to achieve better results. Look for the data that matters the most. Generate periodic marketing reports through advance analytics tools. Develop parameters of marketing metrics to be monitored. Focus on specific metrics that are linked to the goals you’ve initially set. 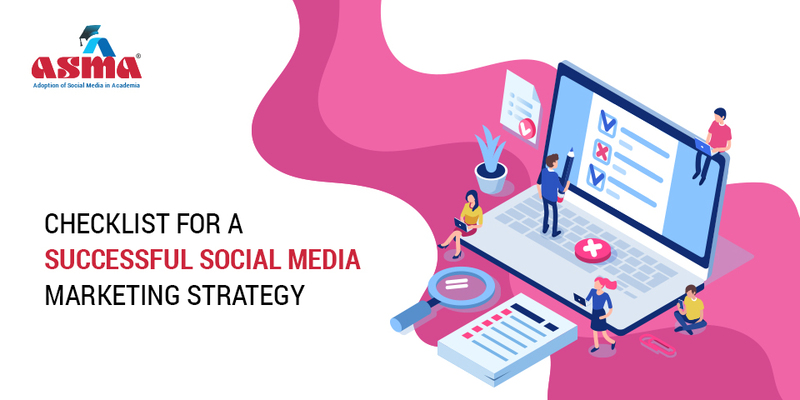 Some of the metrics to measure progress on social media could include likes, comments, and shares to measure increase in engagement or brand awareness as one of your goals. While on other occasions, you may want to monitor increase in new sign-ups for your newsletter or blogs, increase in website traffic, and SEO ranking etc. Now the most crucial part of your checklist i.e. the set of activities that will help you achieve success. These can be divided into daily, weekly and monthly action points. Start by creating a periodic calendar of postings based on a pre-identified theme. Follow social listening for brand mentions. Monitor reactions on your post – likes, comments, shares. Comments and questions must be addressed timely. Include trending hashtags in your post copy. Check what your competitors are doing on social space. Identify best performing posts / themes. Analyse weekly performance of ongoing campaigns. Monitor contribution of social networks in your web traffic. Collect monthly analytics to run progressive campaigns. Track lead generation campaigns against budget spent. Finally, integrate the learnings in your next month’s strategy. Your ultimate social media checklist will help you improve efficiency of your marketing campaigns. By working towards your goals through a checklist strategy, you don’t have to worry about ad-hoc changes and can progress in a much more structured way. Each one of these checklists can be edited to fit your schedule. Once you are ready to increase your efficiency even more, try including them in your marketing calendar. It will definitely let you control every aspect of your social media all from one place.